The piano music of the greatest of all Danish composers, Carl Nielsen, has been overshadowed by his magnificent series of six symphonies, but his piano music has always had a special place in the appreciation of music lovers, ever since Nielsen's music began to spread across the world in the years immediately following World War II. 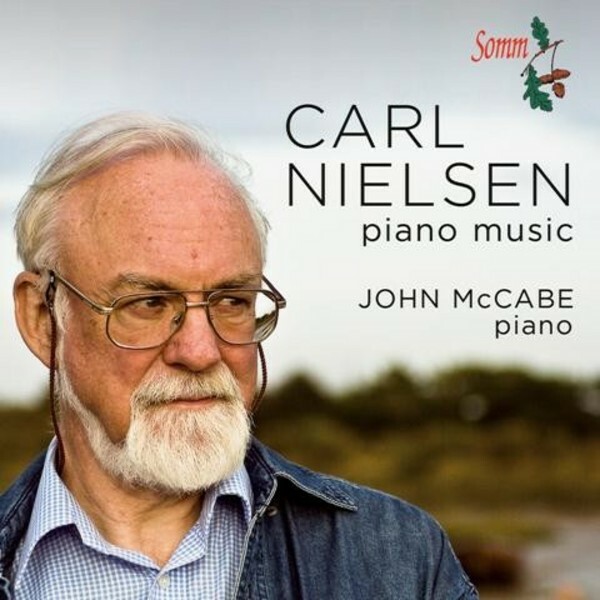 In this legendary recording, the great British composer and pianist John McCabe plays virtually all of Nielsen's solo piano music, including the four masterpieces - Chaconne Op.32, Theme and Variations Op.40, Suite Op.45 and the Three Pieces Op.59 - revealing them as being worthy of comparison with any other great piano music by 20th-century composers. In addition, John McCabe also includes almost all of Nielsen's lighter solo pieces, especially the two sets of 'Piano Music for Young and Old' which Nielsen composed towards the very end of his life - a distillation for beginners of the essence of his musical thinking. These performances, originally issued in 1975 on Decca's Ace of Diamonds, shed profound light on the music of Nielsen. These recordings have been unavailable for many years. Now newly remastered and sounding better than ever, these profoundly impressive accounts are given a new lease of life, and will be widely welcomed by the many admirers of the music of Nielsen, uniquely interpreted by John McCabe, an equally admired fellow-composer who was also a virtuoso pianist - he sadly died in February 2015.